Lake Dental in Forest Lake is a comfortable, relaxing place. You can read the latest magazines covering an interesting range of topics if there is a brief wait. Our approachable, friendly staff is here to assist you with any questions you may have. You’ll find that we spend more time than other practices for checkups, consultations and cleanings. Our dentist listen carefully to your concerns and ensure that you have a pleasant, positive experience with us. Our dentist will meet with you to chat about your concerns and what you may or may not like about your smile. We’ll also talk about any dental experiences you’ve had in the past that weren’t optimal to ensure that we do everything we can to put you at ease. Next, your dentist will take a look at your teeth, gums, jaw and bite, as well as talk through any sleep problems you have that we may be able to assist with. You’re welcome to put on headphones and listen to music of your choice while we do our work. If needed, we’ll take digital X-rays, but only do so when indicated. Sometimes, our patients have called to schedule a checkup and clean, which we’ll proceed with on your first visit. Otherwise, we’ll discuss the future visits necessary to reach your dental goals, all possible treatment options and the costs involved. We are not here to judge you on whether you look after your teeth. We’ll help you improve if you wish, but there is no need to feel concerned about how your teeth look. We want to make sure you feel at ease, knowing that we have your best interest in mind. If necessary, you can have nitrous oxide during your procedure. Contact us for more information. We also offer NuCalm®, which involves a combination of natural vitamins and minerals to help you feel comfortable. All health funds are accepted at Lake Dental. A HICAPS machine is available on-site to process your claim straight away. 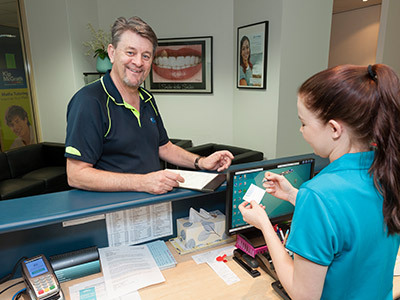 We offer MediPlan (by Zip Money), Mac Credit and Denticare. Schedule your appointment with our warm and welcoming team today! Same-day appointments are available, just call us in the morning!